Luxor is in Upper Egypt, south of Cairo. I would have anticipated that Upper Egypt was north and Lower Egypt was south, but it is the exact opposite. The terms upper and lower are reversed due to the altitude of the land. Luxor can be found along the banks of the Nile River, once again monuments related to life are typically on the East Bank and monuments related to death are on the West Bank. 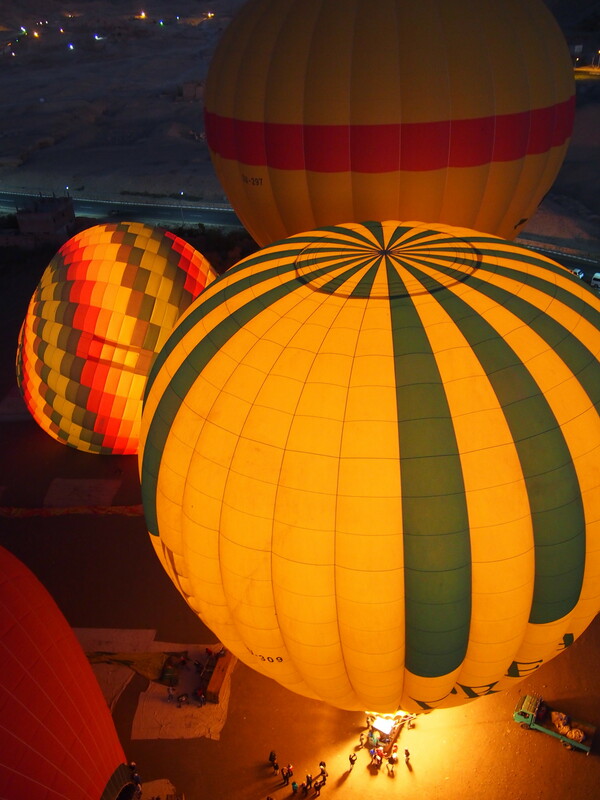 Luxor has numerous breathtaking, history-rich monuments worth visiting, but with limited time my visit had four highlights: Hot Air Ballooning, the Valley of the Kings, the Temple of Hatshepsut and Karnak Temple. 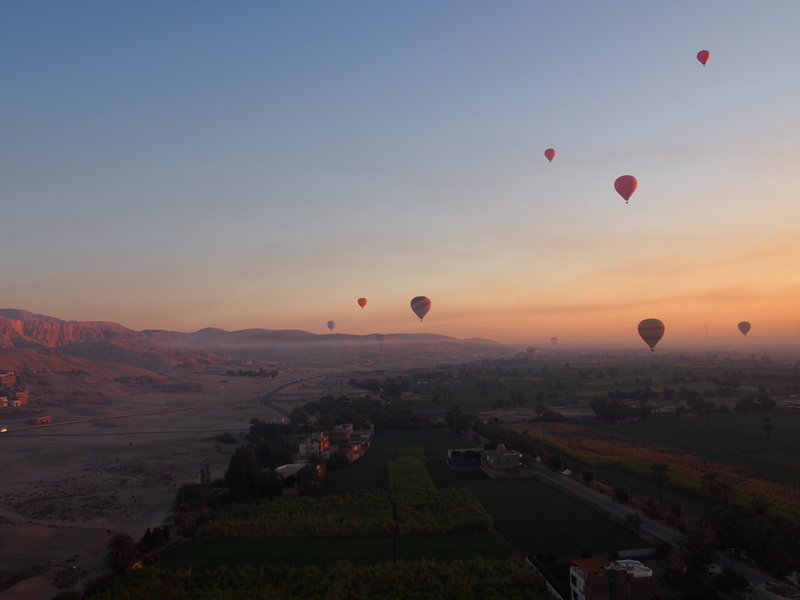 With a 5am hotel pickup, followed by a ferry crossing the Nile, we had the opportunity to get carried into the morning sky for a most peaceful sunrise over the West Bank of Luxor. We had hoped to fly over the Valley of the Kings, but the wind didn’t work with us in this regard. Despite not flying over the Valley of the Kings, we did fly over some spectacular temples and monuments, including the Temple of Hatshepsut. The sun rising and casting golden-orange light on the mountains and temples was absolutely breathtaking. It was a fantastic way to start the day. 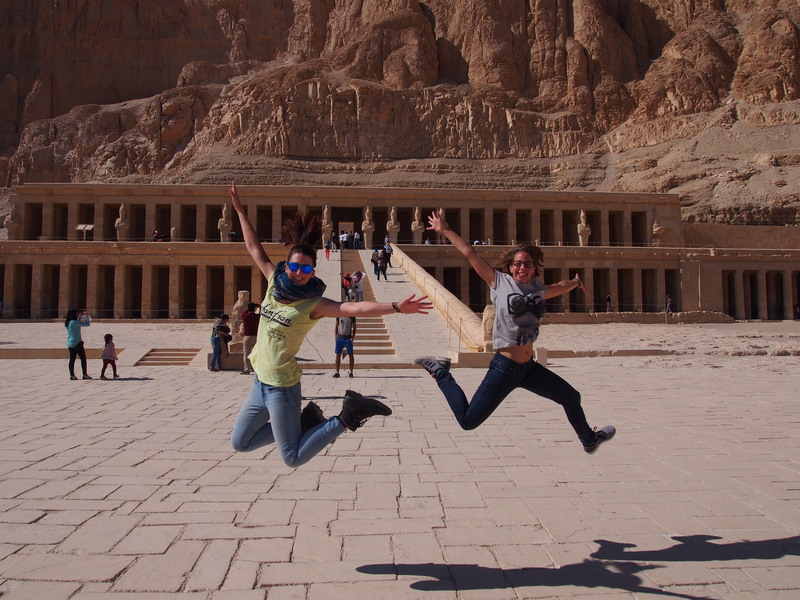 A ticket to the Valley of the Kings provides you access to three tombs. Not all of the tombs are open all of the time, so you need to pick which three you would like to visit, based on what is open (our guide gave us recommendations). In the event you want to visit the tomb of Tutankhamen, it is an additional ticket. 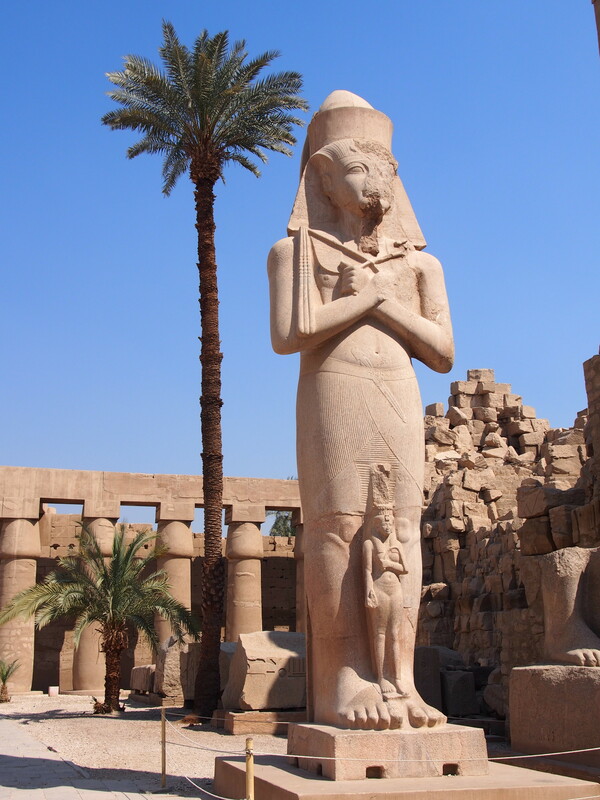 I visited the tombs of Setnakht, Merenptah, Ramses IV and Tutankamen. It is forbidden to take photos inside any of the temples, if you try to sneak a photo you are likely to be fined and excessive amount of money or have your camera confiscated. We were advised to leave our cameras in the bus. There is a ‘safe’ storage facility on site for you to check in your camera, but the staff there advised us that anything left there will be stolen. So either leave your camera on the bus or keep it out of sight. The tomb of Setnakht was recommended for us to visit as it is viewed as the mummification temple, based on the scenes depicted on the walls. It was an absolutely beautiful temple with many of the painted walls retaining their original patterns and colours. The tomb of Merenptah was the tomb that extended the deepest into the mountain, of all the open tombs on the day we visited. Based on what I know about the depth of the various tombs in the Valley of the Kings, it wasn’t as deep as I had anticipated, but nonetheless amazing. The thing that is most mind blowing is the size and weight of the sarcophagus’, boxes and treasures that would have been inside each tomb. The tomb of Ramses IV is the most spectacular of the open tombs in the Valley of the Kings. The colours on the walls are the most vibrant in this tomb. The attention to detail is absolutely amazing. The tomb of Tutankhamen is actually really small and he was a quite an insignificant king. The reason that it took so many years to find is that it is actually situated beneath another tomb. When it was found, it had been untouched and all the treasures were all still tucked neatly into their separate rooms within the tomb. As it was the only tomb to have been discovered completely intact, Tutankhamen became one of the most well known kings in Egyptian history. These treasures can now be found in museums, but the mummy of Tutankhamen remains in his tomb and the walls remain beautifully decorated. 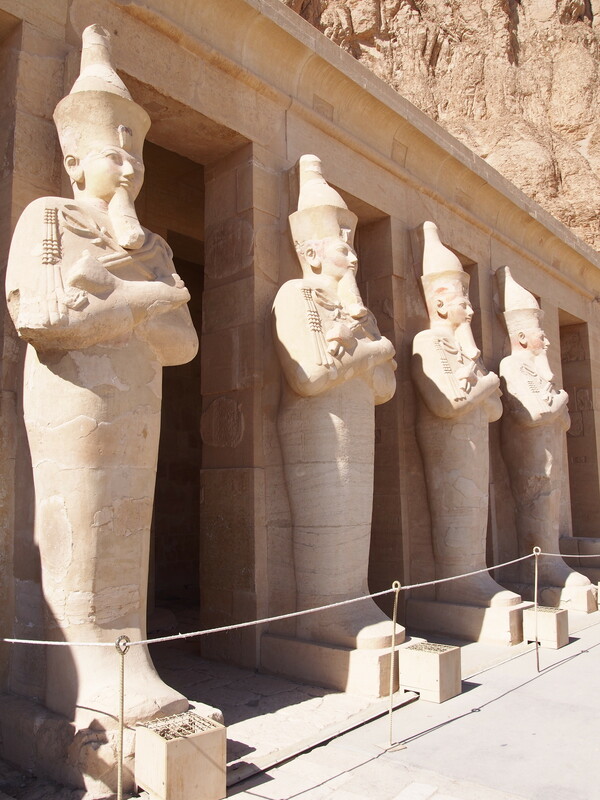 Hatshepsut is the only Queen to have been buried in the Valley of the Kings. She was a woman, but portrayed herself as a man, though I can’t recall why this was. The scultptures of her at the front of the temple clearly depict the body and clothing of a man, but with the facial features of a woman. While I did not visit her tomb in the Valley of The Kings, I did visit her temple outside the Valley of the Kings. Around the temple of Hatshepsut are many hieroglyphics and paintings. Including many depictions of the Cow Goddess of fertility, Hathor. While completely unrelated to the Cow Goddess, the Egyptians have an interesting belief in regards to the cow and earthquakes. They believe the earth is carried on one of the horns of a cow. When she tires and moves the earth from one horn to the other the earth experiences an earthquake. Karnak Temple was found in 1985 in very poor condition. The complex housed seven temples, only two of which remain. The main temple which remains is the biggest of it’s type in the world. Karnak Temple has been a popular location for Hollywood movies and some of the more famous films it has featured in include The Mummy, Indiana Jones and James Bond (I’m not sure exactly which one for any of those).